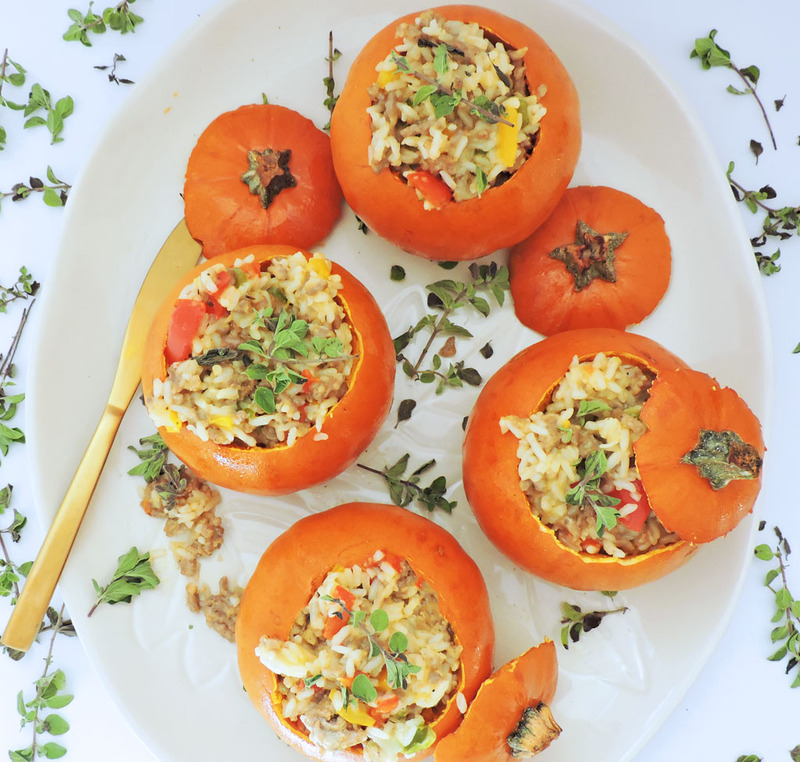 With the holidays quickly approaching, you’ll want to make sure that you have these Mini Sausage & Rice Stuffed Pumpkins on the menu! Did you know that Thanksgiving is just a few days away?? I don’t know about you, but I feel like this year has gone by superfast! By the time I was buying Halloween decorations, the department stores were already putting out Christmas decorations! I didn’t mind this because I love Christmas, but it did give me a slight panic attack knowing that the holidays were almost here and I haven’t’ even started planning my holiday menu yet!! If you ask my kids, what’s their favorite thing about the holidays, they will definitely say “The presents!” If you ask me that same question, I would definitely say, “The food!” And it’s not because I’m greedy, lol, I just really enjoy getting together with my family and cooking some of our favorite family recipes! 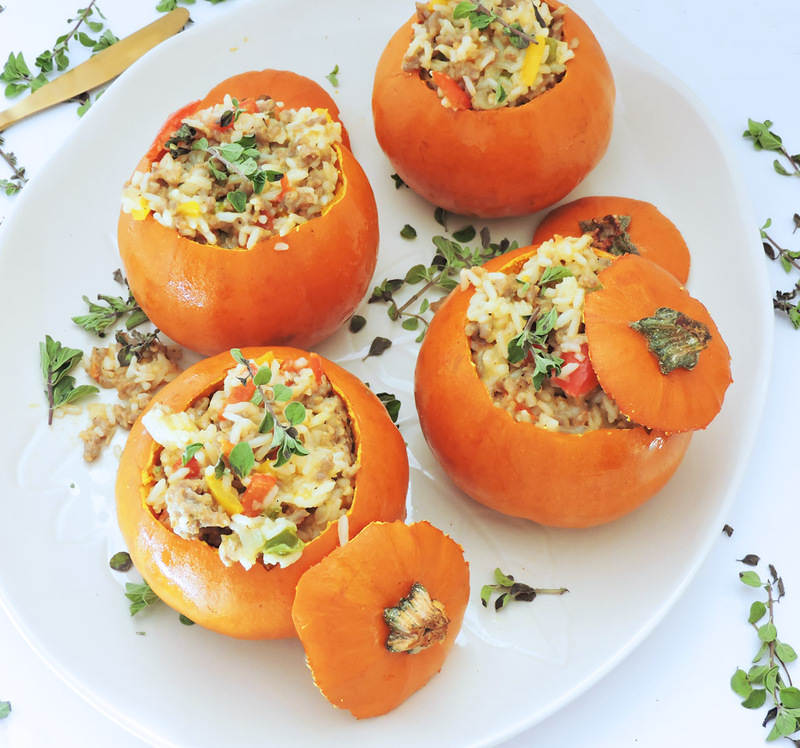 A new family favorite are these Mini Sausage & Rice Stuffed Pumpkins! In addition to being extremely delicious, these mini pumpkins make the cutest table décor! I’m all about making food that doubles as table decorations! Lol! 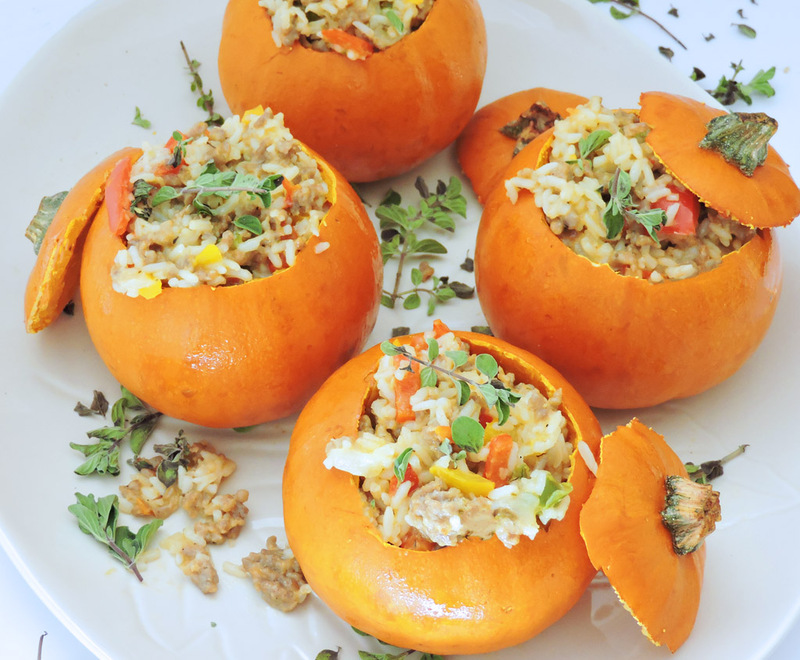 These Mini Sausage & Rice Stuffed Pumpkins are the perfect addition to your Thanksgiving menu! And even though they look kinda fancy, they are actually very easy to make! Before cutting the tops off of your pumpkins, place them in the oven for about 10-15 minutes. This will soften the pumpkins a little bit, making them easier to cut. Once you’ve cut the tops off of the pumpkins, place them into the oven to roast for about 15-20 minutes. 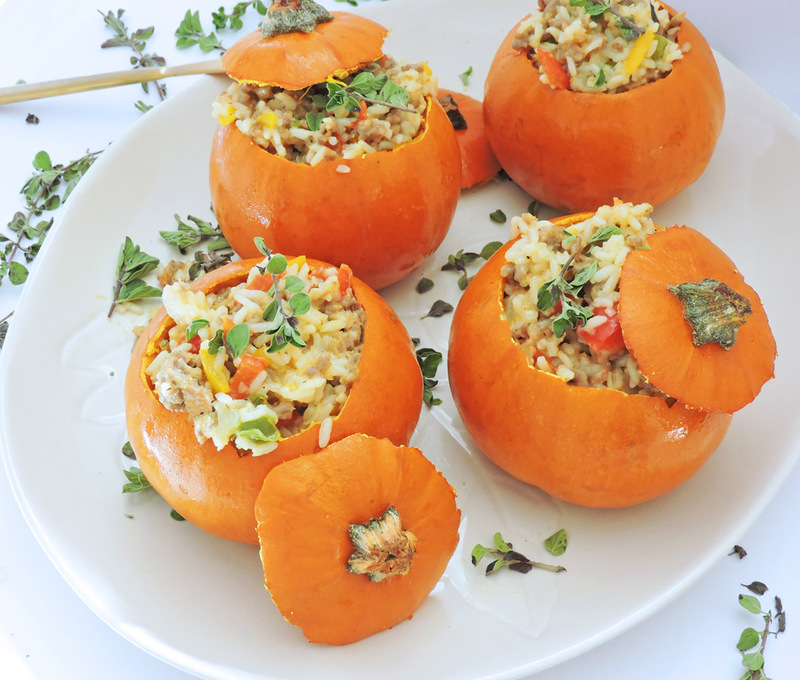 Next, whip up your sausage and rice mixture and start stuffing your pumpkins! Top each pumpkin with a little thyme and you’re ready to serve them to your guests! 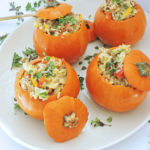 I served these Mini Sausage & Rice Stuffed Pumpkins at my Friendsgiving Party and they were a big hit! And of course, they looked gorgeous on the table! ? Go ahead and add this recipe to your holiday menu and let me know what you think!! Be sure to follow me on Instagram and Pinterest for more holiday recipe inspiration! Slice the tops off the mini pumpkins and scoop out the seeds. Rub the pumpkins and tops with 1 tbsp of oil and sprinkle with salt and pepper. Place the pumpkins (with their tops on) on a prepared baking sheet. Roast for 15-20 minutes or until the pumpkins are just tender. Set aside. Meanwhile, add a tablespoon of olive oil to a medium skillet on medium-high heat. Add the sausage, bell peppers, and onion. Cook until done and until veggies are tender. Drain off excess grease. In the same pan, add chicken broth, white rice, thyme, and shredded mozzarella cheese. Stir until combined. Season to taste with salt and pepper. Stuff the pumpkins with the sausage and rice mixture. Sprinkle with the remaining thyme for garnish.